MJ from Soapisms.Com. Do you have a case of the soapisms? I'll bet if you're reading this you do. Have no fear however, as it is no where near as bad as having a case of the runs. Ah yes, Cold Process, Hot Process, Re-Batched, Hand Milled, Melt and Pour - it's all great fun and us soapers are a passionate bunch. Do you Have a Case of the Soap Isms? 42 year old female, mom of 4, enjoying the simpler things in life, like a good old fashion bar of soap. Here is what I am working on today... Tell me what you think. 1) I melted clear glycerin M&P as usual and added color (blue oxides) and Fragrance Oil (Raspberry & Vanilla) and some Essential Oil Anise Seed (just a very small amount). 2) Filled an empty (clean) milk carton with ice cubes. 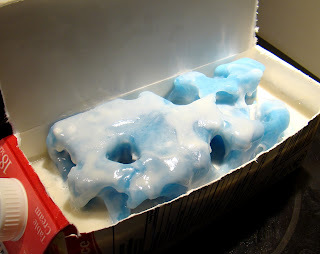 3) Poured hot M&P soap over the ice into the carton and gave it a couple of taps and whacks to make sure all of the air bubbles were out. It doesn't take long for this to set on ice, but you have to leave it alone until the ice cubes finish melting inside of the brink. 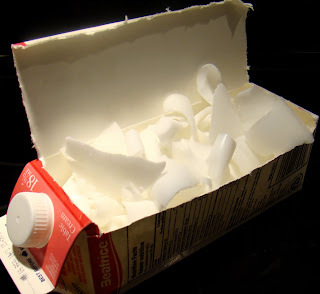 Once melted, release the brick from the milk carton (mold), and let the water drain out of the brick. Make sure you don't leave any water behind. After it drained, I took a paper towel and gently wiped the brick down, getting rid of any left over water. I chopped up enough white M&P soap base to fit loosely into a clean milk carton. 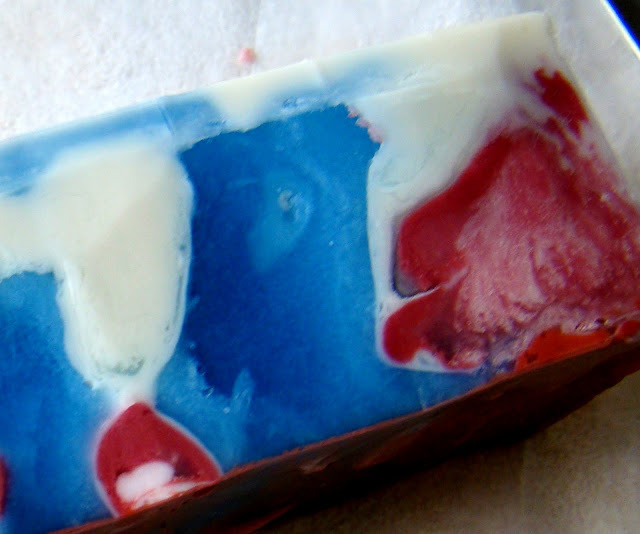 This is a great way to estimate the amount of soap base you'll need to cut up. 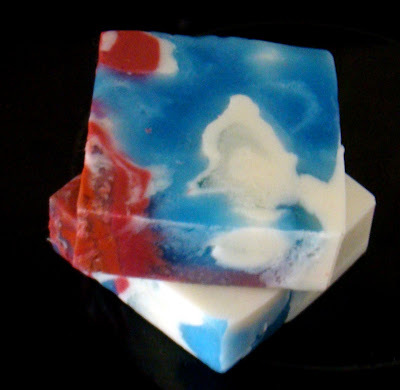 I returned my white soap base to a microwavable dish and melted it, adding more Raspberry & Vanilla fragrance oils, as well as a tbsp of Shea Butter. 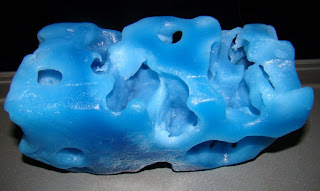 I poured approximately 3/4 of an inch of the white melted soap base into my empty milk carton, then placed the blue soap brick into the mold. (I sprayed each side of the brick with rubbing alcohol to ensure that the white soap would adhere to the brick. With the melted white base I had left, I set aside about 1/4 of it and mixed my color into that small portion. I chose a raspberry red. 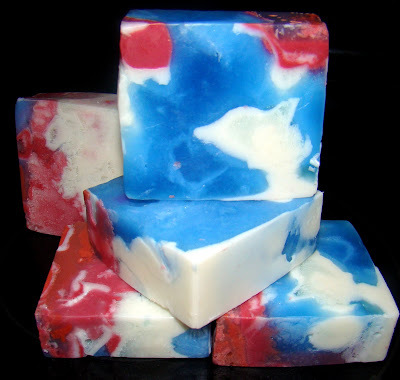 I used an oxide colorant instead of FD&C or liquid soaping colors to make sure that the color would be vibrant and strong. 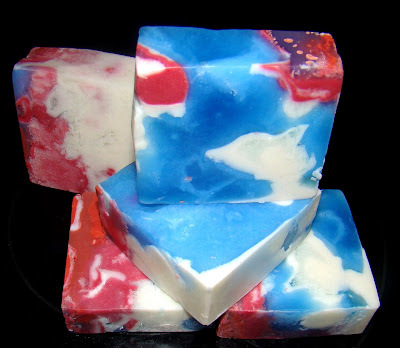 My oxides are water soluble, so I mixed it onto a couple of teaspoon of water, which should not hurt the integrity of your melt and pour soap. 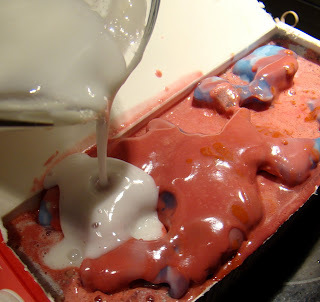 Leaving the colored melt and pour aside, I moved on to pouring the remaining white melt and pour soap base over the blue brick in the milk carton (mold). I poured slowly, making sure to tap the sides and let any air pockets out, also making sure to fill as many of the holes caused by the ice cubes as possible. I left approximately 3/4 to 1 inch at the top of the milk carton. Now I warn you......This is where things get to looking a little on the ugly wuggly side. Don't say I didn't warn you, ok? I then poured my the layer of red, and I thought "Man is this ugly looking", but continued on, pouring the red until 1/4 to 1/2 inch of room was left on top for one final layer of white. 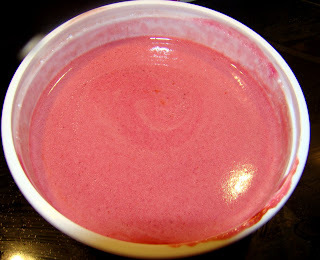 You may want your layers clean, so you would have to wait for the red to form a thick skin before you pour. If you do this, you may want to spray the layer with alcohol before pouring again to ensure that your layers adhere. I wanted my colors to run into one another, so I poured immediately. Again, tapping to release any air pockets. So I began slicing and was pleasantly surprised at how pretty it was inside. The following pictures are the bars sliced, though not trimmed up perfectly. 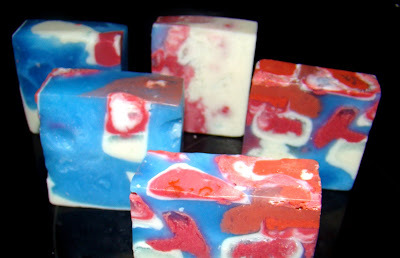 This was a fun experiment, and as ice goes, you can be sure that no two soap loaves made with this technique will ever be alike. 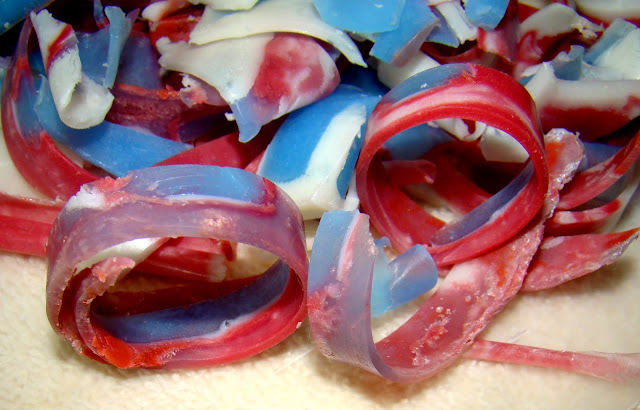 I always take great care to keep the soap shavings in good condition for my next project. These little shavings will be great for using as embedded raspberry soap chunks in your cold process soap! 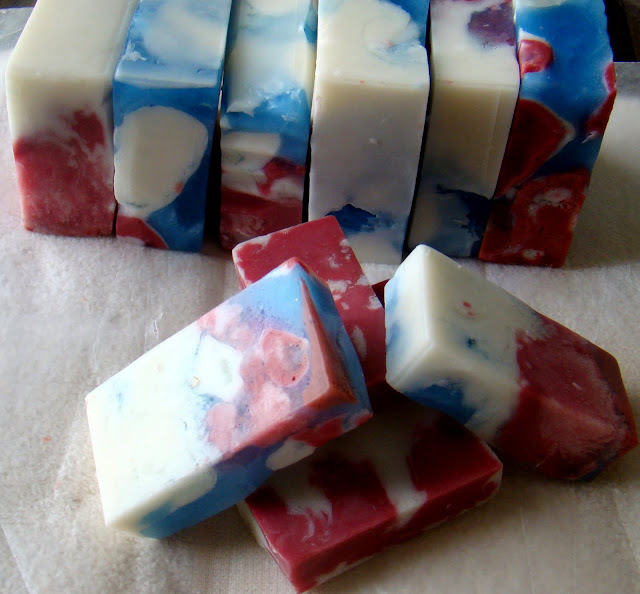 Mixing the two techniques can provide your CP soap with an extra boost of smell since the M&P tends to hold the fragrances much better. And of course, I always try to make a few sample sized bars from the two ends of the loaf. Thanks for viewing! If you are a beginner, please feel free to ask me anything you would like to know. Send me a message through Facebook.